If you love fishing, then you will always want to make sure that you are purchasing the best tackle possible. There are so many different pieces of gear that need to be used by a fisher if they want to be effective, so we won’t blame you if you are a little confused by the wide variety of options available. For instance, you will want to ensure that you have the right lines for the type of fish that you expect to be fishing. If you invest in lines that are too heavy, it will be inconvenient to reel in fish as the line itself will put up nearly as much resistance as the fish that is tugging on the other end. Of course, invest in a fishing line that’s too light, and it might just snap on you. Over the course of today’s guide, we won’t be looking at fishing lines, but we will be looking at something that is closely related to lines. We are going to be searching for the best spinning reel of 2018. Attention: The internal data of table “11” is corrupted! We will be reviewing ten different spinning reels, all of which are competing for the title of the best product in that category. While this may sound relatively straightforward, we are also going to be taking a look at some advice for those looking to buy a new spinning reel, as we may be able to help you make the right choice. If you are an experienced fisher and you already know what you want out of your spinning reel, you may wish to skip straight to the reviews, and you can feel free to do so. On the other hand, beginner anglers will likely want to take a look at some additional info to ensure that they make the right choice. Before we get into any of the details, however, let’s establish a groundwork and make sure that all of our readers are following along. We’ll take a look at what exactly differentiates a spinning reel from other forms of fishing reels and some other info that may be able to help you make a better choice. As you may have guessed, a spinning reel is a type of fishing reel, which is itself a piece of equipment that is attached to your fishing rod. Reels provide a mechanical advantage that makes it easier to bring a fish in, and they were invented in the late 12th century, which may come as a surprise to some. There are a few key features that differentiate a spinning reel from other kinds of fishing reels. The most recognizable aspect of a spinning reel is that it features an open design that keeps all of the mechanisms exposed. While this will make for a lighter reel that is simpler to construct, it also needs to be protected from corrosion. Most of the time, anglers will consider a spinning reel as an intermediate choice as it is relatively easy to use. To cast the line, you move the bail wire to one side, and then you flip it back over when you want to arrest the progress of the line, similar to the button operation of a spin cast reel. When you want to reel in the line on a spinning reel, all you have to do is turn the handle, though the bail wire may take some getting used to. The versatility of these reels is what makes them the most popular option as you can use them in many different depths and for various fish species. There are many other kinds of fishing reels, and they are typically classified as either fly reels or standard spin reels. The spinning reel, as you may have guessed, is part of the latter category. Let’s take a look at some of the differences between other kinds of reels and spinning reels. These are often seen as the best reels for children and beginner anglers because they are so simple to operate. While this kind of reel operates similarly to a spinning reel, you will find that it features an enclosed case that makes corrosion and other damage to essential components less likely. 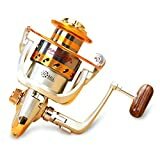 This type of reel is cast by pressing a button to release the tension on the line, when you want to stop playing out your line, all you have to do is push the button once more. Even though this method of operation is straightforward, these reels have a few downsides when compared to other choices. A spin cast reel will typically have lower build tolerances than other kinds of reels of the spinning variety. What these means in practice is that you will have a less accurate cast than you would if you used a spinning reel or a baitcasting reel instead, though this is not that important for beginners. This kind of fishing reel lies on the opposite end of the spectrum to the spin cast reel, as it is made for the most advanced fishers. This kind of reel does not feature a mechanism that locks the reel, so you will typically have to maintain constant tension on the handle, which requires much more concentration. The advantage of a baitcasting reel is that you will have exact control over where your line ends up as long as you pay attention to the spool. Keeping track of the spool may be a bit of a challenge, but it is not impossible if you put effort into ensuring that it will stay exactly where you want it. A baitcasting reel is not the best option for fishing trips with your friends where you just want to sit back and relax until you get a bite. On the other hand, if you are going to be doing some intensive fishing where you will need the greatest degree of control over your cast, a baitcasting reel is invaluable. Since fly fishing is very different in practice when compared to spin fishing, a fly reel will not have many similarities with other reel types. In fact, fly reels tend to be the most simplistic reels on the market, and they are easy enough to use once you have mastered the technique of fly fishing. Since the cast is much more manual in fly fishing than spin fishing, you will not have a mechanism that plays out the line on one of these reels. Instead, you choose the length of line that you will need for your cast by running it out by hand. The fly reel itself is there for two main purposes: storing your line and providing an easy method of retrieval. When you think about it, without a reel, your fly fishing line will end up getting tangled with ease, and it would be nearly impossible for you to transport without a reel. Fly reels tend to be single-action models which means that no mechanical advantage is provided by the reel when you are retrieving your line. Every time you turn the spool once, you the reel itself will complete one revolution as well, which makes line retrieval a little more precise than otherwise, if a little more tedious. In the end, your choice of fishing reel will entirely depend on the type of fishing that you will be doing, and you won’t want to use a spin fishing reel for fly fishing. Due to their simplicity, fly fishing reels tend to be much more affordable than spin reels. You may be wondering why you should put so much effort into choosing the right spinning reel and whether or not it is worth it in the first place. We can reassure you that you will want to put quite a bit of research into choosing your best spinning reel as it will benefit you in the long term. While some beginner fishers may think that your choice of reel is inconsequential, you have to remember that every part of your tackle will influence whether or not you are successful when fishing. There are several benefits to choosing the right spinning reel right off the bat. First off, researching your choice of spinning reel makes it nearly impossible that you will end up dealing with buyer’s remorse as you will know exactly what you will be purchasing. Instead of trying out a reel and having to go through the hassle of returning it, you can just get the best option the first time. 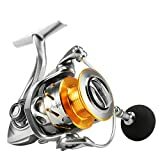 Of course, you may also end up purchasing a spinning reel that looks like it may be an excellent choice at first, and then it will end up failing on you after a short period of use. Some models may not even come with a warranty, so you will end up losing the money that you spent on a poor quality reel. Would you rather not rest assured that you are choosing the best spinning reel possible? Hold your fishing rod with your casting hand right by the reel seat. Keep your non-dominant hand ready to reel, as spinning reels are designed to be used with the opposite hand to the casting hand. You will want your bait to be around 0.5 to 1 foot away from the tip of your rod before you cast. Press the line against the rod with the index finger of your casting hand in preparation for your cast. Move the bail wire out of the way to ready the line for casting. Be careful to keep your index finger on the line so that it doesn’t run out prematurely. Prepare your cast by swinging the rod over your shoulder. Heave your fishing rod forward, while you release the fishing line with your index finger at the same time. Many features can make or break a spinning reel, and we’ll be taking a look at each of them in turn over the course of this section. 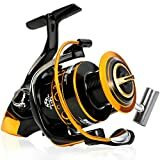 If you are experienced in the use of fishing reels of this type, it is likely that you already know what to search for in the best model, so feel free to skip ahead to our reviews if you prefer. The type of material that your spinning reel is made out of is one of the first things that you will want to consider when you are choosing the right model. There are many different choices when it comes to the construction of your spinning reel, and each of them will have their own sets of pros and cons. This is the type of material that you will want to avoid when you are looking for the right spinning reel. Most of the time, you will find that children’s spinning reels are made out of plastic, but it is simply not the kind of composition that you will want for something like a fishing reel. Other than the potential for corrosion in saltwater environments, a plastic fishing reel is simply not durable enough for extended use. While these reels will be much more affordable than other options, you are better off spending a little more money on a reel that will work reliably for some time to come. Steel used to be a popular material for use in fishing reels, but it has been largely superseded by other options that are a little more convenient. While steel is certainly durable enough to put up with extended use, it has the disadvantage of being much heavier than other metals that are used. Stainless steel reels are relatively hard to find, as most of them have been replaced with aluminum models that are slightly less durable but much more lightweight. Some budget models may still feature steel components, but they are largely being phased out of use. 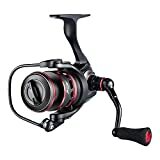 This material tends to be the most common choice that is used in the best fishing reels because it provides an excellent balance of affordability, durability, and lightweight. There is a reason that aluminum is used in applications that range from aerospace to cycling, and that is due to its versatility. When it comes to fishing reels, aluminum is durable enough to put up with corrosion for a reasonable period of time, but it will start to wear out after extended use. If you want a spinning reel that is reasonably priced but still capable, it is very likely that it will be made of aluminum. Magnesium is commonly used in high-end freshwater reels because it is much lighter than aluminum while still maintaining a relatively high degree of strength. One of the issues with this material is that it tends to corrode very easily, so they will need to be coated for saltwater use. If you opt to use a magnesium reel, you may have to take some time to get used to the balance of the fishing rod since it is much lighter than many other metals. If you are looking for the best spinning reel for use in freshwater conditions, it is very likely that it will be made of magnesium. Finally, you will also have graphite fishing reels as an option, and they are quite similar to magnesium reels in practice with one major difference: they resist corrosion. It is for this reason that most lightweight saltwater reels will be made out of carbon fiber. You may be wondering why all spinning reels are not made out of graphite or carbon fiber if it is such an effective choice, and it has to do with the durability of this material. Graphite tends to crack when it sustains a shock, so if you need a durable saltwater spinning reel, you may wish to opt for aluminum instead. While the gear ratio of a fishing reel may appear like a complicated matter to the uninitiated, you will find that it is quite simple to understand, and it has to do with mechanical advantage. As you may know, a ratio is expressed in terms of two numbers, such as 7.0:1 (read as seven to one) or 5.0:1. What do these numbers mean? In the case of a reel that spins at 7.0:1, it means that the spool will rotate seven times every time that you rotate the handle. Smaller ratios will result in a slower reel in. Most spinning reels will feature a ratio somewhere between 5.0:1 and 7.0:1, though there are always outliers. When it comes to choosing the right gear ratio for your spinning reel, it is largely a matter of personal preference, as it will influence how you fish. If you are more of an aggressive angler, it is likely that you would prefer a higher gear ratio so that you can bring in a fish faster. Slower gear ratios make it so that the fish isn’t jerked around as much while you are reeling it in, especially in stronger currents, which will make it less likely to slip the hook. Some anglers will say that gear ratio doesn’t matter while others will argue that it can make a significant difference, but the only way to find out for yourself is through experience. Ball bearings are the components that ensure that your reel turns smoothly while you are using it, and the number of them determines the extent of that smoothness. Since ball bearings are components that need to be machined with exceeding precision, they can get surprisingly pricey. Most spinning reels will feature somewhere between 3 and 11 ball bearings, and they will have to be protected from exposure to the elements. One of the worst things that can happen to a fishing reel is rust forming on the ball bearings as it will then struggle to turn if it still can in the first place. When choosing the right reel, you will want to account for the size of the reel that your fishing rod is compatible with, as that will make it much easier to use. Keep in mind that you can sometimes use fishing reels of a different size on some rods, you will be better off going with the recommended reel size. Choosing the right reel size will help ensure that your rod is balanced when you cast it out, making it much easier to fish, especially for beginners and newer anglers. Keep in mind that larger reels will typically be more expensive because more raw material and effort will go into their construction. You will always want to make sure that you are buying a spinning reel that will function for some time to come. Opting for fishing reels that will need to be replaced every few months may save you money in the short term, but it is very likely that you will end up spending more on replacements in the long run. There are many ways to ensure that you are purchasing the best spinning reel when it comes to reliability. First off, you will want to make sure that you get a reel that is made out of the right material for your needs. You will also want to take a look at the build quality of your fishing reel. The care with which a spinning reel is assembled will determine whether or not it will last long enough to give you your money’s worth. Of course, there is also the fact that quality fishing reels are downright more pleasant to use than models that are haphazardly assembled. The C-30 is one of the most versatile spinning reels on the market, and it couples that versatility with excellent build quality that goes a long way towards making this the best reel on the market. While this fishing reel may be relatively small, you will find that it is still more than capable. For example, the 6 to 8-pound line weight that works with this reel is perfect for applications that require a little more finesse like jigging. If you are a more experienced angler, then it is very likely that this spinning reel will work wonderfully. This model also features a blade body that will resist corrosion much more efficiently than other reel body types. One of the more impressive aspects of this reel’s design is that it features eight bearings, seven of which are standard ball bearings and one of which is an anti-reverse roller bearing. 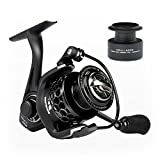 While this reel may be relatively small, don’t underestimate it because of its size, because it is much more effective than many other spinning reels that are much larger than it. If you’re looking for the best spinning reel on the market and you don’t care how much you spend on it, you have a few options that are very pricey. We find that most spinning reels above a certain price point will give you diminishing returns, and this is why we have chosen a relatively affordable high-end model: the Penn Battle II. This fishing reel is an excellent choice for anglers who need an effective drag system coupled with a smooth reeling action. The inclusion of six bearings (one of which is an anti-reverse bearing) means that you won’t have to deal with hiccups or other issues while you are reeling in a fish. If you tend to fish in saltwater and you are worried about corrosion ruining your spinning reel, that won’t be an issue with this product. The Battle II by Penn is designed to withstand damage from saltwater, even over an extended period of time, so it will serve you for some time to come. KastKing Summer and Centron Spinning Reels, 9 +1 BB Light Weight, Ultra Smooth Powerful. GREAT VALUE - Loaded with features yet low on price. KastKing Summer/Centron offers the best value...at any level. The KastKing Summer Fishing Reel turns any angler into a PRO. The Centron 2000 from KastKing is the best choice for those who want value for money before anything else when it comes to their spinning reel. While this is not the most affordable spinning reel on the market, it provides an excellent compromise between quality and price point. 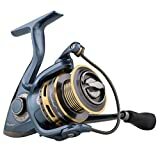 For example, the inclusion of nine ball bearings in addition to a single non-reversible bearing means that you can enjoy a smooth reel-in when you feel a bite. The construction of this spinning reel is another aspect that is quite impressive. The Centron 2000 is made out of graphite and aluminum, with the frame being made of the former and the spool itself is made of the latter material. The use of graphite in this model makes it well-suited for use in salt-water conditions, though the spool may degrade over time. 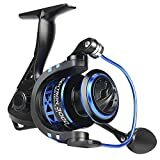 This lightweight reel is an excellent choice for beginners or for intermediate anglers who want a reel that they can abuse without spending too much on it. Overall, this model impressed us for the price. When you’re looking for the most affordable fishing reel on the market, there are few options that can match the 2000 Series from X-CAT. You may be wondering just how effective a spinning reel can be for such a low price, but you would be surprised by this model. With a gear ratio of 5.5:1, it is neither exceptionally quick or slow, but this reel features a smooth action that makes it a breeze to use when you compare it to competitors in the same price range. If you’re looking for a throwaway reel, this model will work excellently. You will find that the 2000 Series even comes equipped with some features that you wouldn’t expect to find on a product that is so affordable. For instance, the handle can either be folded in for compactness, or it can switch sides for lefties. Of course, this reel won’t match models that are available for ten times the price, but it is still capable and effective (sometimes surprisingly so). When looking for the best lightweight spinning reel, you will need to balance durability with low weight, and the Piscifun 3000 does this perfectly. Made of carbon fiber, this reel won’t give you any issues with corrosion, and it is much lighter than the competition, at 9.1 ounces. One of the most impressive features of this spinning reel is that it can provide up to 26 pounds of drag power, which is quite impressive for a reel that is so light. This model also comes equipped with 10+1 bearings for improved smoothness while in use. When it comes to durability and reliability, the carbon fiber frame isn’t the only part that resists corrosion. For instance, the drag system features a rubber ring to keep it sealed against corrosive water. Even the handle on these models is impressive, with a soft, flat, rubber design that is ideal for use with freshwater fish that aren’t too heavy. Larger versions of this reel will feature a bigger knob to ease the capture of heavier fish. SMOOTH - saltwater rated double shielded stainless steel ball bearings,you'll love it because of silky smooth retrieve of the reel. The Burning Shark spinning reel is the perfect choice for those of you that want a reel that is simple to use without too many fancy details. It is equipped with 12 ball bearings and one reverse one that allows for a smooth reel when you get a catch. The material that this product is made out of (carbon fiber) is one of the best out there since it makes the reel reasonably strong without any extra weight. Other materials are a lot heavier and can change the performance of your fishing, so this lightweight reel won’t compromise it. Another feature that you may find interesting in this reel is its gear ratio, which is 5.1:1. Although it is a little slower than most top-notch reels out there, this may be beneficial as you will not have to worry about the fish unhooking from the reel moving too fast in the water. However, you should keep in mind that this also raises the chance of a fish getting away on its own. This reel is perfect for intermediate fishers who need a reel that is relatively affordable. If you are looking for a spinning reel that has great quality with an affordable price, the KastKing Mela II 4000 spinning reel will be a great option for you. You will be pleased to know that this reel is designed to last longer than many other models due to its high degree of corrosion resistance. Being anti-corrosive means that it can withstand any saltwater that you decide to go fishing in since different bodies of water will affect certain reels differently. This, coupled with a sleek, black design, means that you will be fishing in style without having to worry about reliability. Another significant aspect of this product is that it comes with an additional graphite spool. This is very handy since it precludes the need to invest in another when you need a replacement. 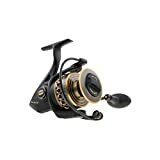 Also, this reel is equipped with precision brass gears and a hardened metal main shaft that improve the smoothness and durability of the reel as a whole. In the end, this reel is surprisingly durable for a model in its price point. The Pflueger President spinning reel is another great choice for fishing lovers out there. There are many measures in place to ensure that this reel lasts a long time. For example, you have the ten ball bearing system, which is corrosion resistant. The stainless steel construction of these bearings keeps them in excellent condition even with use in corrosive water. The reel is also made out of graphite and aluminum, two materials that are resistant to damage and corrosion. The body of the reel is the portion that is made of graphite to ensure that the reel is not only durable but lightweight as well. The handle is made out of aircraft grade aluminum. There is also a sealed drag system in place to further protect the spinning reel from water infiltration. As you can see from many of the features, this reel is meant to last you a long time. The slow oscillation feature helps the performance of your fishing by improving the line lay of the reel. There are times when you are casting the line that it doesn’t go where you want it to, or it might twist in the process and with this feature you have less to worry about. Introducing the Rapid fresh and saltwater spinning reel featuring an anti-corrosive coating for salt ad fresh water us. The Rapid offers an enhanced thicker main shaft, stainless ball bearings, and a carbon fiber drag system with 15kg/33 pound drag to land the largest gamefish. The SeaKnight saltwater spinning reel is the reel for you if you are new to the fishing scene. With its simple construction and resistance to infiltration from other substances, this spinning reel is an excellent option for tough conditions. For example, this spinning reel is equipped with a washer that will keep the drag system from malfunctioning due to corrosion or sand. The ball bearings feature a similar shielding system that helps keep them isolated from both of those elements. Even the body of this fishing reel is designed to resist corrosion from saltwater. Keep in mind that this reel is good for more than just resisting corrosion. For example, the drag weight is 15 kg, allowing you to reel in heavier fish without too much of a fight. Overall, this model is good for beginners who need a saltwater spinning reel that can withstand some abuse. For those of you that want a spinning reel that features excellent quality, there are few options that can match the Okuma Inspira, specifically the ISX-30B model. Unlike many other composite spinning reels, this model is made of carbon fiber instead of graphite. Carbon fiber is both stronger and lighter than graphite, resulting in a spinning reel that is more effective, though it is also a little more expensive. The adjustable drag on this model goes up to 13 pounds, which is not the highest you will come across, but it should be sufficient for larger freshwater and inshore fish. This spinning reel features something known as Torsion Control Armor which prevents the internal components from slipping out of alignment, even when exposed to stronger forces. Additionally, the inclusion of a cyclonic flow rotor uses air pressure to keep the reel from getting too wet. Thank you for taking the time to read through our guide to finding the best spinning reels that are available. Whether you need help deciding what to search for in your reel, or if you just came for our reviews, we hope that you have found everything that you need. What is the Best Line for Surf Fishing? Do Bass Bite After a Rainstorm?